Sesame seeds are generally regarded as nutritionally inconsequential ornamental additions to bread and bagels or incorporated in culinary presentations to add visual interest and subtle flavor nuances, especially with Chinese cuisine. As is the case with most medicinal foods, consuming small quantities of sesame seeds often over time is recommended to help improve health and resist disease. Sesame seeds are high in calories, which scares some calorie counters away. But it only takes a small amount, around a quarter-cup daily of these inexpensive nutritionally dense seeds, to receive sesame seeds’ health benefits and protection against many autoimmune diseases. The medicinal aspects of sesame seeds were used by ancient cultures thousands of years ago. During the last twenty years or so, western medical research has been discovering valid clinical applications of sesame seeds and their compounds. One way to get more sesame seed into one’s diet is to utilize the “nut butter” form, tahini, used in popular Asian and Middle-Eastern foods such as hummus. Sesame is among the oldest cultivated plant foods in general and specifically the oldest seed oil plant still available. Originating 5,000 years ago in ancient India, sesame plants became a large part of Asian and African agriculture, which then became popular in the Mideast. They can flourish in any warm region regardless of rainfall amounts. Sesame seed plants (Sesamum indicum) grow to around three to maybe five feet tall. They are hardy plants that can withstand high heat with little water, making them almost drought tolerant. First flowers blossom then pod-shaped fruits appear on branches. As those fruit pods begin to dry, they expose their seeds, which are edible and capable of being pressed for edible oil. They come in different colors and they have to be hulled from out of their small hard shells. Sesame seeds were valued for their oils 5,000 or more years ago, then became favored for medicine in ancient Egypt, according to 3600-year-old scrolls. Today sesame seeds intact or hulled are available in most health food stores, sometimes in the refrigerated sections. It is the hulled variety that is mostly used. The research on sesame seeds is sometimes done as an adjunct to pharmaceutical drugs intended for treating and relieving common modern world health issues such as diabetes, high blood pressure, and inflammation. But you don’t have to use pharmaceutical drugs in order to benefit from sesame seeds, nor do you have to consume sesame oil directly. The oil’s flavor is overwhelming and suitable mostly as a spicy addition to certain oriental dishes. But it is often used topically for various skin conditions. Sesame oil is more easily consumed in gel capsules. Consuming the seeds directly is what this article is about. An Ayurveda doctor recommended one tablespoon of raw sesame seeds with the same amount of dry raisins twice daily to improve digestion and colon health for a close family member. Gradually, positive results were achieved. After thousands of years of use in the earth’s northern hemisphere without ill effects, it’s easy to determine sesame seeds’ safety without testing for that. They contain very high volume to mass ratios of magnesium and calcium, both vitally synergistic for bone density, nervous system operation, and heart health. and phosphorous, which supports many health conditions in addition to bone health. Sesame seeds are high in B vitamins and polyunsaturated fatty acids with sufficient fiber to aid digestion and bowel elimination. Highly antioxidant phytosterols are prevalent in sesame seeds. The most common caveat against eating too many sesame seeds or oils is because they contain phytates. Some claim much of the phytate issue is overblown. Anyway, most sesame seed protocols call for small amounts, usually a quarter cup of seeds daily. So if there is no unusual allergy indication, there’s no reason to not include sesame seeds as part of your lifetime diet. Are you familiar with hummus? It’s a tasty, healthy dip, spread, side dish or topping for cooked foods used in Mid-East cuisine. And it’s a convenient way to get your daily dose of sesame. A major component of hummus is tahini, which is a sesame seed paste. 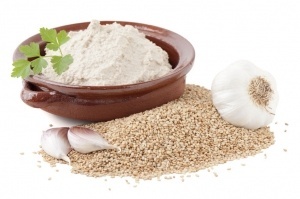 Tahini is also available in health food stores or specialty markets from both raw and roasted sesame seed sources. If you make your own hummus, raw tahini is recommended. The video below is a good guide for making your own tasty hummus. But you can be flexible and adjust the ingredients according to your taste and quality requirements. I use a food processor instead of a blender, more olive oil, freshly squeezed lemon juice instead of lemon juice from a container, and more garlic cloves and tahini. My garbanzo beans (chick peas) are home-cooked from organic dry chick peas soaked overnight.